We dragged ourselves out of bed this morning. Originally, our plan had been to kayak over the weekend, but we foolishly heeded the weather forecast, which warned of certain thunderstorms. As it turned out, it was decent kayaking weather, albeit somewhat gusty. No matter. 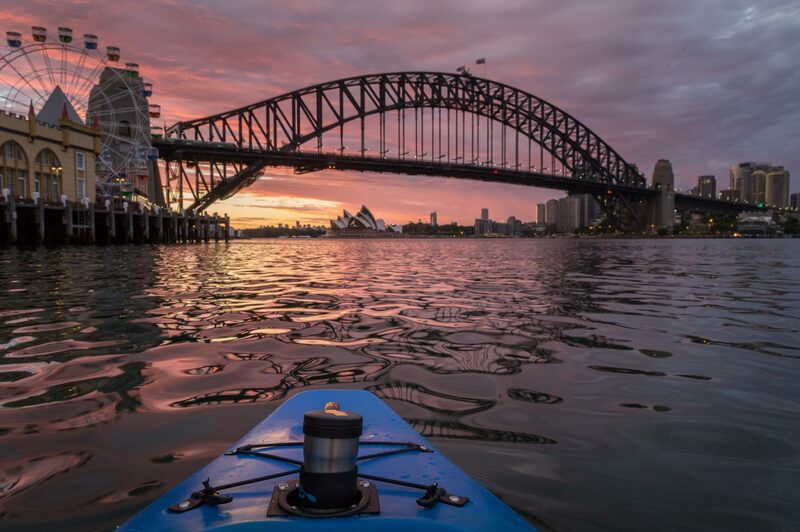 We launched our kayaks right about dawn, and paddled for the Harbor Bridge. It was a somewhat overcast morning, but the breeze was slight, so we shrugged off the last vestiges of sleep and reveled in the calm. First a cruise ship materialized in the horizon, blocking our view of the opera house. Then out of nowhere, the second one appeared, this one bound for Darling Harbor. But it was gliding ever so slowly, such that it didn’t leave any wake. Totally worth the early morning rise! Haha, but to be honest, I think the next time we get back to this side of the harbor would be New Year’s Eve. Hard to believe we’re just a day shy from December already. Goodness.